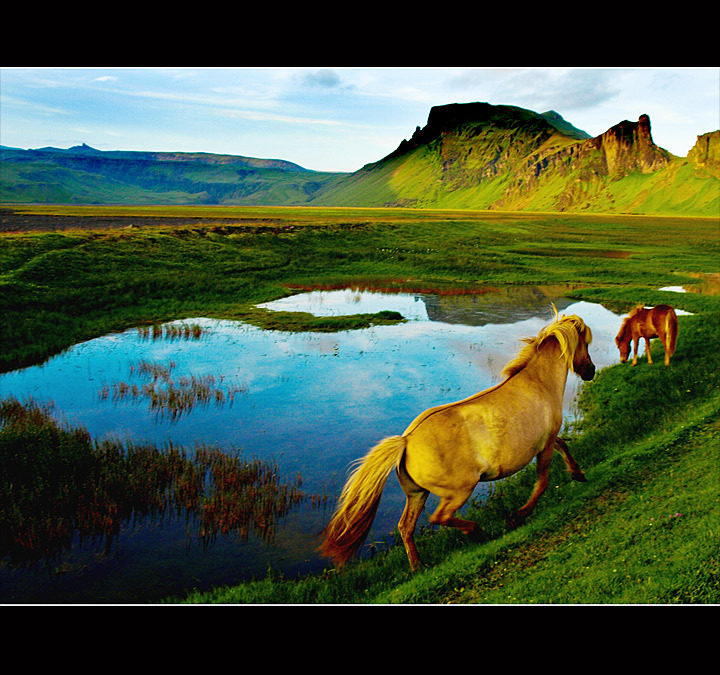 Icelandic horses late in the evening during mid-July in southern part of Iceland. Worked on the file first in Lightrooms, cropped the image, brightening it up a bit and made some tonal arrangements, exported the image to PS for levels, curves, hue/saturation before resizing and sharpening. Framed and saved for the web at last. strange and beautiful. 8 from me. Good comp, but colors are garish. Great title. Love the shadowy toning on the horses. I like the over sat effect here, it seems to work well with the title. Nice work. excellent shot with a unique perspective. nice colors just a touch too much yellow IMO, still excellent shot. 6 - Nice image, I see the potential cropping dilemma but still, the angle of the land below the mountains distracts me, so even with the horse right at the corner of the frame, a nudge rotate up on the right or a perspective correction probably be better, in my opinion. Proudly hosted by Sargasso Networks. Current Server Time: 04/26/2019 03:41:25 AM EDT.